Some optimism on a blood test for Alzheimer s but don t ask for it yet. In the fight against Alzheimer's, memory loss has kept its place as the frontrunner of early warning signs, but that may no longer hold true. Experts unveil that sharp changes in behavior and personality could indicate very early stages of frontotemporal dementia. 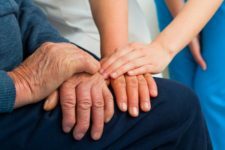 They shared the findings and other themes at the annual Alzheimer's Association International Conference in Toronto over the weekend. The findings, they say, prompt a discussion about a possible new diagnosis: mild behavioral impairment (M.B.I.). A checklist of questions regarding irritability, agitation, temperament, and sudden loss of interest in hobbies may aide doctors, patients, and loved ones in recognizing the onset of the disease, sometimes years before memory loss and cognitive decline occur. The M.B.I. clinical designation (which has unofficially been around for some time), along with the questionnaire, would follow its predecessor, mild cognitive impairment (M.C.I), which was created roughly ten years ago to describe early symptoms of dementia. Patients diagnosed with M.B.I. and subsequently M.C.I often fare worse over time, and — according to experts, many aren't diagnosed with full-blown dementia a decade later. So, identifying the symptoms early on could mean better care and treatment. Some experts argue that M.B.I. would come with its own set of challenges, since a change in behavior could unintentionally clump a large number of people into the wrong category; patients would need to show at least six months of behavior and personality shift before a diagnosis could even be determined. Still, stress, medications, and other outside factors could affect how a person tests on the surveys, and roughly 20 percent of patients who have been given an M.B.I. assessment in the past have shown normal cognitive activity later. Similarly, the panel discussed how intellectually tasking jobs, especially ones that focused on interacting with people, may lower the risk of Alzheimer's disease, according to a study presented at the conference from the University of Wisconsin's Alzheimer's Disease Research Center. The researchers found that people who work with complex data and numbers, and interact with people on a daily basis are more likely to be protected against the disease, as opposed to jobs that require working on your own, analyzing data or working machinery. Two other studies supported the findings: researchers from Toronto found people with higher education and mentally stimulating jobs had greater protection from developing Alzheimer's. In this study, researchers looked for tiny brain lesions — a common symptom associated with Alzheimer's disease — in MRI scans from 284 healthy people in their 60s. They found that people with brain lesions who held jobs that required a lot of interaction with people tend to maintain their ability to think and problem-solve. In another study, researchers looked at ways diet and brain health correlated; Though it could not prove cause and effect, the findings showed a 'Western' diet — red meat, bread, potatoes, and sweets — was associated with greater cognitive decline. But the major caveat: Those with a mentally stimulating lifestyle were protected against the disease, even if they followed a 'Western' diet. Since there are no effective medications to treat mood swings and behavioral issues associated with dementia, researchers say early detection is a double-edged sword. Still, the findings are preliminary and have yet to be published in a peer-reviewed journal.